LG unveiled a plethora of devices at this year's CES in Vegas such as it's K Series line of affordable smartphones and displays. However the standout gadget for me is this foldable OLED display (pictured above). 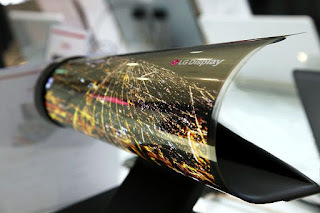 Although Samsung has demoed a foldable or rollable display in the past, LG's effort seems to be the one that's closest to finding its way to the market. One can only dream of a day, when you could fit a 40in display in my messenger bag or a smartphone with a foldable large screen that could quite easily fit in my breast pocket.